In spite of long work hours, a language barrier, and a relatively short time in the Rogue Valley, Ramón Balbuena is firmly committed to involvement in the educational lives of his children, and to developing educational leadership within local Latino parent communities. Ramón is a founding member of Migrant Education’s Parent Advisory Committee, an inter-district council of migrant parents, which meets monthly. The PAC provides a forum for parents to discuss educational concerns, and to provide input to inform and improve the programs and services Migrant Education provides to migrant students. The PAC meetings also provide parent leadership training, which will prepare parents to increase their involvement in school classrooms, on PTA’s, Site Councils, and beyond. Balbuena arrived in the Rogue Valley in 2000 from Ixtlán del Río, Nayarít, México, leaving his family, wife, and two small children, in the hope of finding work that could sustain them. 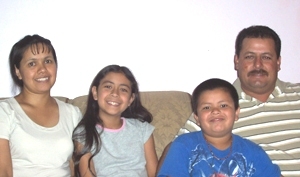 The family was reunited in 2001 when Ramón’s wife María arrived with their 5-year-old daughter Osmaida, and 3-year-old son Ramón Jr.
“The economic situation in Mexico is very difficult,” Balbuena said. “I started working with my father, who is a brick maker, when I was 6 or 7 years old but it’s very hard work, and I knew I didn’t want to do it all my life. My parents wanted me to study, but I wasn’t able to finish. It’s hard financially to study in Mexico, it’s not like here where there is so much opportunity.” He made it through middle school, and received a year of technical training in Mechanics. He has worked in Medford at Naumes for 6 years, where for the first 3 years he pruned fruit trees in the orchards. He now operates a variety of heavy equipment, and attributes his advancement to an increased understanding of English. Ramón and María, who both work full-time, have attended night English classes at Rogue Community College, and for three years have participated in Listo, an evening family literacy program provided through the collaboration of Migrant Education, Southern Oregon Head Start, and RCC. María, also a member of the local PAC, cited a lack of English skills for parents and limited outreach by schools as barriers to parental participation. She recalled her own difficulties in accessing services for her younger child as a recent arrival. She expressed her desire for all schools to have procedures in place to regularly inform families about the kinds of programs and services available for kids, according to their individual needs. Ramón worries about high Latino dropout rates, as students become disenfranchised, or leave to enter the workforce. Last year, Mr. Balbuena was appointed by State Superintendent of Schools Susan Castillo to the Oregon State PAC. Ramón and María made the trip to Salem to meet with migrant parents from throughout the state, and to see the variety of educational possibilities that are being offered around the state to migrant children. This is the first year that Southern Oregon has been represented at the State PAC, and the Balbuenas saw first-hand how underrepresented our region is in overall statewide leadership. Ramón added that he was impressed by the level of organization and involvement by parents and students, and with the number of Latino community members in key leadership roles. He says the experience inspired him to talk with his own children about their plans for the future. María added, “As children we thought about going to work so that we could survive. Now we talk a lot with our kids about the kinds of careers they’d enjoy.” Their daughter Osmaida, now a 6th grader at Talent Middle School talks about a number of possibilities, and right now, she’d like to be a lawyer. Ramón Jr., a 4th grader at Phoenix Elementary, enjoys inventing new things. After a year of working with the PAC, the Balbuenas say that, despite the barriers migrant families experience, they believe that all parents can get involved and stay involved.